Doyle Herman Design Associates is an award-winning landscape design firm that creates extraordinary design by integrating artistic expression within the contextual perspective of the presented architecture. We seek inspiration from the past and are often guided by aspects of traditional design but we also share an enthusiasm for a more modern aesthetic when desired. Our approach to landscape design involves deciphering, translating and responding to a location and its existing physicality. Each project begins with a holistic evaluation of the intrinsic qualities of the environment and its relationship to human habitat. Utilizing this stylistic philosophy generates a harmonizing result between architecture and its surrounding landscape. We specialize in helping our clients develop and implement beautiful landscape design ideas. Contact us for container plantings, perennial gardens, foundation plantings and more. LaGuardia Design actively pursues an interest in how elements of the native landscape, existing topography and neighboring influences help define the character of each site. Led by Principal Christopher LaGuardia, the focus of our design, from commercial parks to large rural estates, is to unify the landscape into a cohesive link firmly connecting architecture and site. The Firm’s work is strongly influenced by a modern aesthetic, focusing on clear spatial ordering and efficient site relationships. Through creative collaboration with clients, architects and consultants, we effectively develop original design solutions that are responsive to the requirements of site, program, schedule and budget. Each project begins with a thorough analysis of the defined objective and the sensitive realities of a site and its context. We devise, test and refine a range of schemes and ideas in accordance to the objective, which helps us to achieve an appropriate fit with the client’s needs and the site. We design and build timeless landscapes focusing on customer driven preferences. We design all types of landscapes from more formal geometric forms to natural meadows of grasses and wildflowers. Our mission is simple. To create inspirational landscape features, where exquisite plant combinations compliment only the finest quality hard landscaping construction. Keith E. Simpson Associates is a design firm of landscape architects providing site planning and design services for developers, corporations, municipalities, private institutions & individual owners. 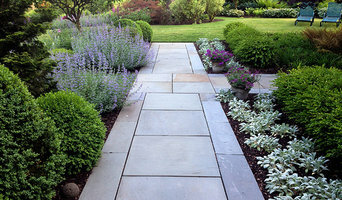 Residential landscape design and project management in Westchester NY and Greenwich CT area. Our goal is to become the best at what we do by providing our clients with superior customer service and the highest quality craftsmanship. We will not be satisfied until you're completely satisfied. We design and install residential landscapes, working closely with our clients to create outdoor living spaces of exceptional beauty, sustainability, and quality. Whatever your vision, Odd Job Landscaping brings your outdoor living dream to life with the utmost professionalism, site cleanliness and ease. We are a complete site development company. Robert Schweitzer started working as a landscape designer in 1986. With over 30 years of experience, he prides himself in creating beautiful, functional, environmentally friendly landscapes. QDG prides themselves in creating stunning living environments though the artistry and engineering of comprehensive landscape design. They conceptualize, expedite and implement the design's intent through the orchestration of vetted artisans that have been qualified year after year to meet their high standards. Vincent and his team attentively listen to the goals of their clients to transform needs and wants into functional, beautiful solutions. They visualize the potential layout of the components of the landscape tediously working through concepts into designed ideas seamlessly to bridge architecture and landscape. QDG works tirelessly to ensure the master plan's detailed intent is adhered to, strengthened, and kept on budget through their diligent onsite construction administration and consultation. We offer site planning of all exterior components, including: Plotting the house location and elevation Driveways Court yards Walkways Pools/spas Tennis courts/game courts Perimeter plantings Outdoor kitchens Cabanas and showers Putting greens Herb/vegetable gardens Screening/fencing ...and any other wish our discerning clients can dream, or need they have to satisfy. This is a true design build firm made for the client by the client and with the client Q.D.G. Design - Build - Furnish. MVR specializes in tree planting, tree care, tree preservation and landscape design with durable, sustainable plants. We serve property owners directly for landscape planting, design, and arboricultural services, with emphasis on native and drought tolerant plants. 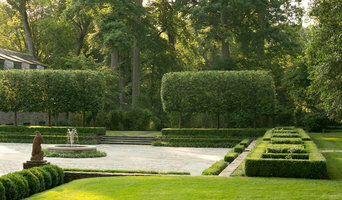 We design beautifully sustainable landscapes and gardens suited to New York State terrain and ecology. For Residential to AE Site Plan Landscapes. 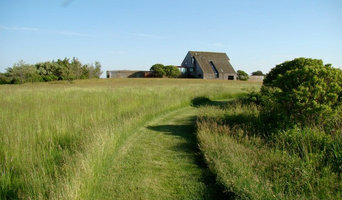 MVR is a Harvard-educated LEED AP so a sustainable landscape is always the aim, making each unique and beautiful. The naturalistic design typical of LGs historically is often still the most practical in Lower NYS, particularly for residential properties, because of the region's prevalent: Century+ Trees, Sloped Outcrop Terrain, & Woodlands. Period Homes, including Moderne (involves more lines). Scenic Sites, with Deer Fences now, as in left rollover. Plants most deer-resistant: Trees. Beauty • Sustainability LGs and trees rate exceptional in beauty, sustainability, and raising property value, with low ongoing maintenance costs. For ongoing savings, property enjoyment, and aesthetics, -- work with 30-year Portfolio of residential success. Christensen Landscape Services, LLC is a full service landscape firm widely recognized for innovative design and quality installations. Our expertise enhances your lifestyle by surrounding your home with a broad complement of landscape options. Because we offer complete hardscape capabilities-including concrete, masonry, and carpentry-there is virtually no limit to what we can create in your landscape. We also have garden and estate maintenance services available in New Haven, Middlesex and Fairfield Counties. 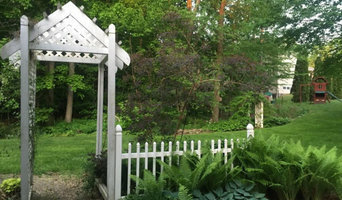 Root & Vine Gardens is a full service boutique landscape design/build firm. We specialize in creating gardens tailored to fit each client's own unique set of needs and desires. Our gardens are designed to be low-maintenance, and we emphasize sustainable practices, including the use of native plants, edible gardens, and low emit drip irrigation systems. Our gardeners follow organic guidelines and never use pesticides. Whether you seek a rooftop sanctuary or a backyard paradise, our dedicated team of designers, carpenters, stone masons, and gardeners will bring your vision to life. 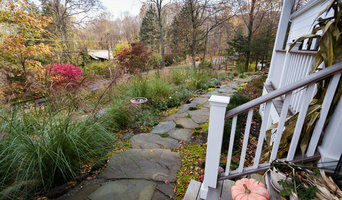 Root & Vine Gardens builds, installs, and maintains custom gardens throughout the NYC metro area. Root & Vine Gardens is a full service boutique landscape design/build firm. We specialize in creating gardens tailored to fit each client's own unique set of needs and desires. Our gardens are designed to be low-maintenance, and we emphasize sustainable practices, including the use of native plants, edible gardens, and low emit drip irrigation systems. Our gardeners follow organic guidelines and never use pesticides. Whether you seek a rooftop sanctuary or a backyard paradise, our dedicated team of designers, carpenters, stone masons, and gardeners will bring your vision to life. Root & Vine Gardens builds, installs, and maintains custom gardens throughout the NYC metro area. Take a look at some of our creations under the tab 'Root and Vine Gardens'.